Is There a Blue Labrador? I was recently asked by someone where they could buy a blue Labrador. Of course my first reaction was that she was joking but the person was genuinely sincere as they had read about these new 'designer dogs' on the Internet. Now, as someone who earns their living from the wonderful world wide web, it pains me to say this but...don't believe everything you read on the Internet! So Is There Such A Thing As A Blue Lab? But, there are plenty of people who claim otherwise and there are breeders who say they breed these dogs. So I suppose the answer should be no and yes. Let me explain. Of course you aren't going to see a Labrador who has a coat of bright blue running around the dog park but the phrase 'blue Lab' is attributed by some people to a shade of silver Labrador. So, a blue Lab is actually silver coloured. Coats Of Many Colours - Or Just Three? Again, opinion is divided. 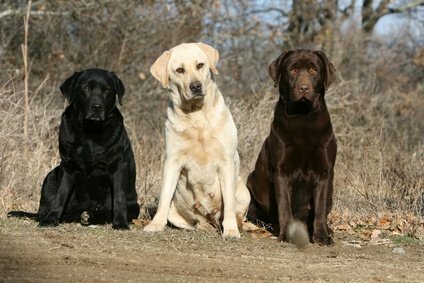 Officially, and in the opinion of myself and most people who love Labs, there are only three coat colours - yellow, black and chocolate. We explain in-depth about this on our Labrador Retriever Colours page. Like many things, the concept of a silver or blue Lab is just a fad pandering to the whims of people who want something 'different' or 'unusual'. It is not my intention to judge anyone and of course everyone is entitled to their own views and opinions. But, I would say that if you are looking for a Labrador please ensure you visit a reputable breeder and beware of people in classified ads who are offering to sell blue Labs or any other shade of Labrador including white (actually yellow) or gold (likely to be a Golden Retriever / Labrador mix).